A big step for TransLink to finally get away from being called a 'pilot' or a 'test!' 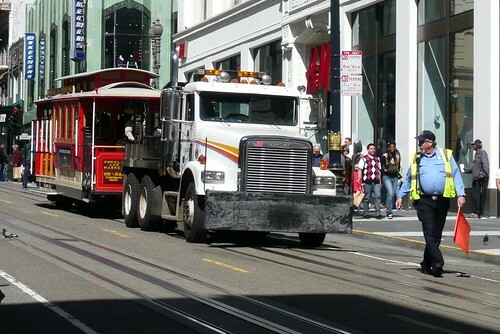 TransLink cards are now accepted on San Francisco's cable cars! All adult fast pass ("A"), Muni only ("M"), and discount passes (youth, senior, and disabled) are the only forms of TransLink media accepted on the cable cars. Passengers paying with electronic cash cannot ride at this time. Whoo hoo! Who is going to be the first person? FYI TransLink officials: Please fix your website to mention cable cars are OK with passes. Due to historic monument laws, Muni was unable to install TransLink devices on the cable car equipment, however conductors are permitted to carry card readers that is like a slightly bulky PDA. The readers are only set for "read only" and are unable to deduct out of the e-cash fund at this time. Muni has not made it official of when the "M" pass will be banned from cable cars, but for you cheapskates (like me), enjoy this moment while you still can. (1) Cable car conductors are able to deduct TransLink e-cash. (2) Install card readers or have conductors use portable handheld TransLink readers on the "rare" fleet of F-Market streetcars (e.g. Boat Car, "Desire," and Melbourne).